In recent years, number theory and arithmetic geometry have been enriched by new techniques from noncommutative geometry, operator algebras, dynamical systems, and \(K\)-Theory. 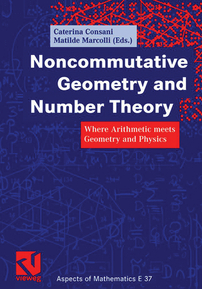 This volume collects and presents up-to-date research topics in arithmetic and noncommutative geometry and ideas from physics that point to possible new connections between the fields of number theory, algebraic geometry and noncommutative geometry. The articles collected in this volume present new noncommutative geometry perspectives on classical topics of number theory and arithmetic such as modular forms, class field theory, the theory of reductive \(p\)-adic groups, Shimura varieties, the local \(L\)-factors of arithmetic varieties. They also show how arithmetic appears naturally in noncommutative geometry and in physics, in the residues of Feynman graphs, in the properties of noncommutative tori, and in the quantum Hall effect. A publication of Vieweg+Teubner. The AMS is exclusive distributor in North America. Vieweg+Teubner Publications are available worldwide from the AMS outside of Germany, Switzerland, Austria, and Japan. Graduate students and research mathematicians interested in geometry and topology.